FUTURE MODELS - email sansim555@msn.com to be placed on the waiting list, or with your wish list. out of selected hardwoods with steel and brass wire parts. Bridge houses and bulwarks made from mahogany wood and naturally finished. Scale 1:600. Length of the model – 10.5" (27.68 cm). This project was initiated by request from Mr. Derek Head, author of well known book "Bassett-Lowke waterline ship models". In March 2008 wait list was open for 8 models only. Sold out! 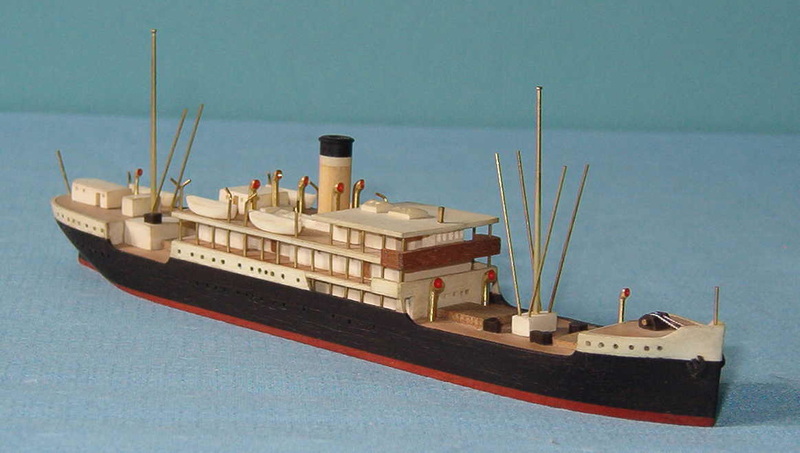 Models are purchased by avid collectors of Bassett Lowke and Van Ryper ship models from UK, USA and Germany. Awatea was built by Vickers Armstrong Ltd, Barrow in Furness in 1936 for service on the Trans-Tasman route of the Union Steam Ship Company of New Zealand. She was one of the fastest liners in the world. Vessel had a very short life and was bombed and sunk in the Mediterranean in 1942 while on troopship duties to North Africa. Model is hand built by marine artist Alexander Scherbak from thoroughly and expertly selected hardwoods, with steel and brass wire parts. Wheelhouse is carved from real mahogany and naturally finished. Monkey island is curved from white holly wood and naturally finished. The wood was stained before priming and painting to insure long life of the miniature. Quality of the model not just reflected in visual result, but built in construction and finishing techniques. Model comes in cardboard box. Scale 1:600. Length of the model – 10 3/8" (26.5 cm). Only 8 model built . Sarpedon was the first ship in the class of 4 passenger cargo steamers comissioned by Blue Funnel Line for Far East service from Liverpool. Built in 1923 by Cammel Laird Birkenhead. She survided the war and was broken up in 1953. She was one of the best looking British ocean liners of her time. Scale 1:600, length 12 1/2". Limited, Clydebank, Scotland. 20158 gross tons, 623 feet long, 73 feet wide. Steam turbines, twin screw. Service speed 16.5 knots. 1843 passengers ( 221 first class,356 second class,1266 tourist class). Liverpool - New York service. Was involved in considerable cruising during 1920s and 1930s, including famous World Cruises. Served as troopship during World War 2. Resumed Cunard service 1949-1956. Scrapped in Scotland 1956-1957. 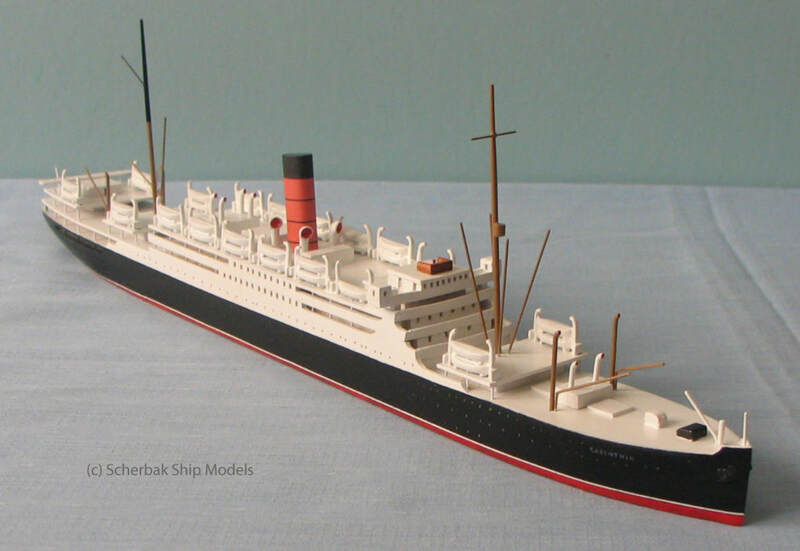 Waterline wooden model of famous ocean liner. Built from blueprints. Beautiful sheer. Recessed windows, hand-written name on the bow. 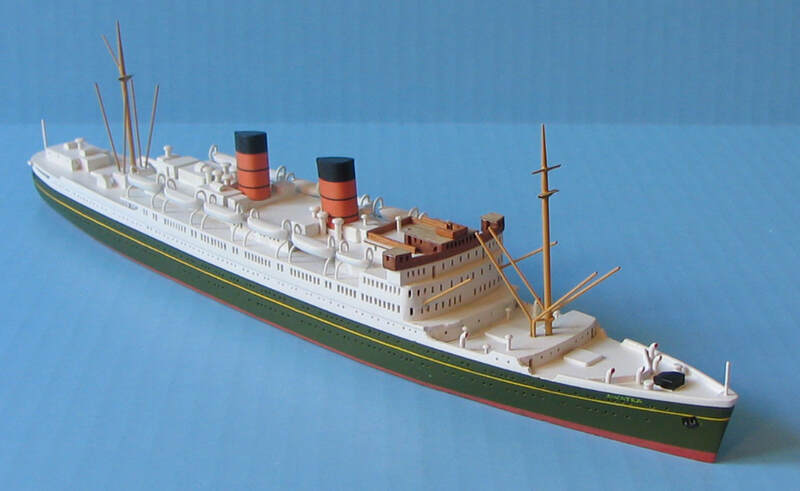 Ocean liner model in scale 1:600, 6" long . Exotic woods and brass, handmade in USA by marine artist Alexander Scherbak. Comes in protective case (wooden baseboard with acrylic cover). ​Only 4 models built, 1 last model available. 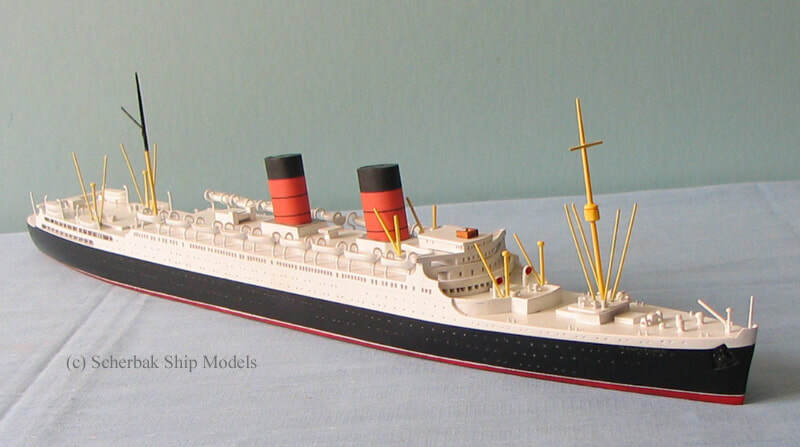 Ocean liner (banana boat) model in scale 1:1250. 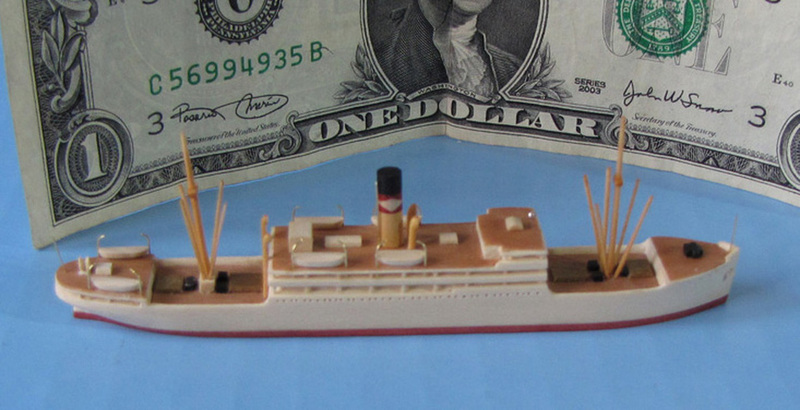 Model is handmade in USA from scratch by marine artist Alexander Scherbak and represents the ship in 1914, when Great White Fleet of banana boats came under American flag. This colorful model is not painted! It is built from carefully selected exotic hardwood with proper natural colors. The hull and superstructure are carved from solid piece of white American holly - the whitest wood available. Other wood used are pear wood, yellow boxwood, pink ivory, ebony, bamboo. The funnel is complex handmade wooden mosaic reflecting beautiful United Fruit marking - white diamond on the red strip around buff funnel with black top. Life boats and ventilators are individually carved from holly and boxwood respectively. Only 3 models built. Sold Out. © 2018 Scherbak Ship Models. All Rights Reserved. No picture, design or text from this website can be copied and used without written approval of Scherbak Ship Models.